What Is the Green Tea Diet and Does It Really Work? Green tea has long been touted as a weight loss aid that can help you shed pounds fast. 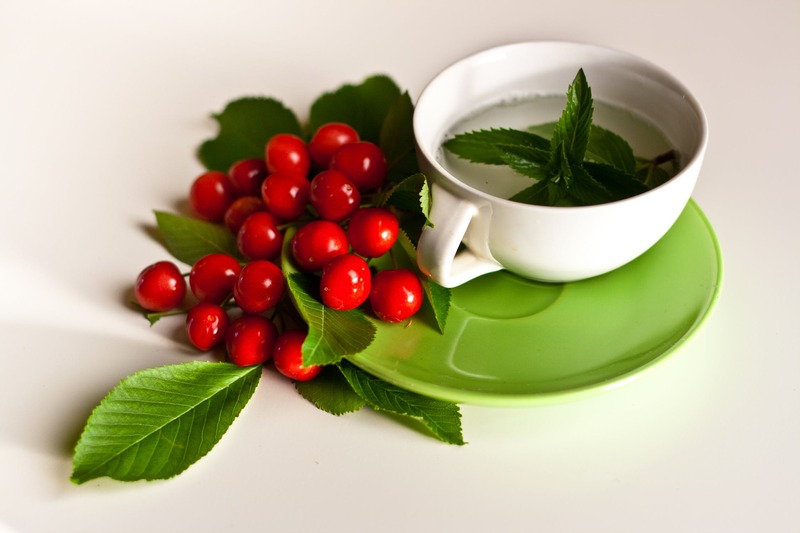 It's packed with antioxidants and healthy compounds that make this beverage revered in Asia. Green tea has been shown to help fight breast cancer cells and may even help you live longer. For those reasons, it's become a staple at mealtimes and in diet plans around the world. One of the main goals for Americans is to lose weight. Unhealthy diets and busy lifestyles make it hard to maintain a healthy weight and easy to gain body fat. Significant weight gain is bad for you. It can cause irregular blood sugar levels and high cholesterol levels. These symptoms can lead to serious illnesses including heart disease and diabetes. Luckily, there are many ways you can shed belly fat—including drinking green tea! We know what you're thinking, a diet where you only drink green tea? Not exactly. 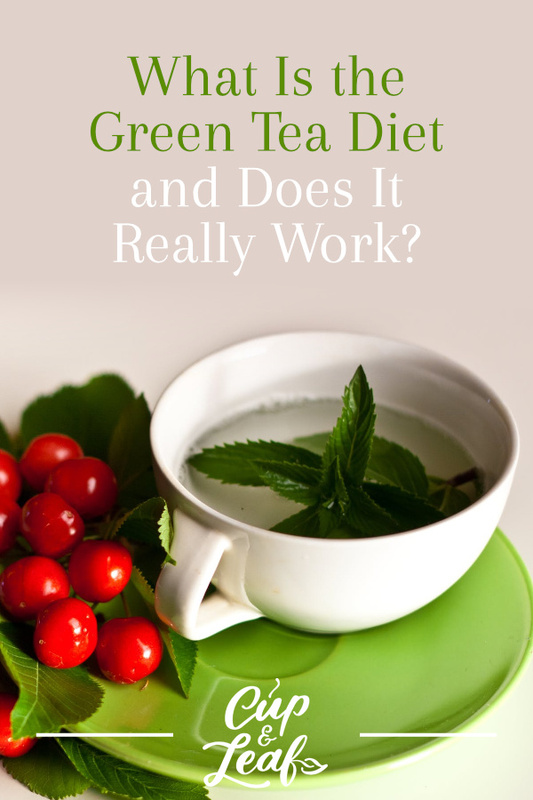 The green tea diet incorporates this healthy elixir into an existing diet plan to help you lose weight faster. We'll show you what the Green Tea Diet is all about and how drinking this beverage may help you reach your weight loss goals. 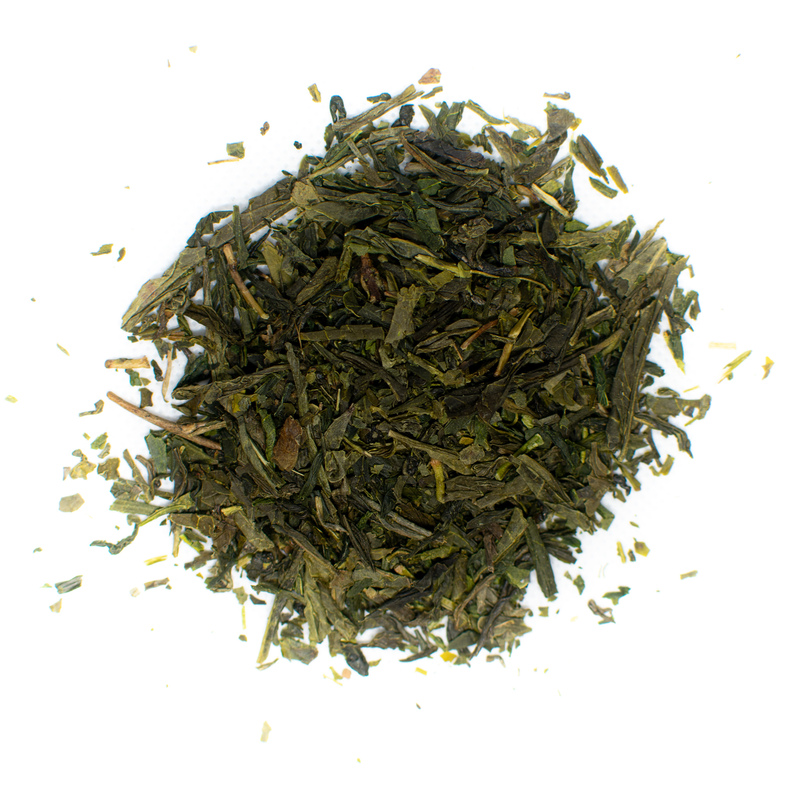 Green tea is made using the leave of the Camellia sinensis tea plant. 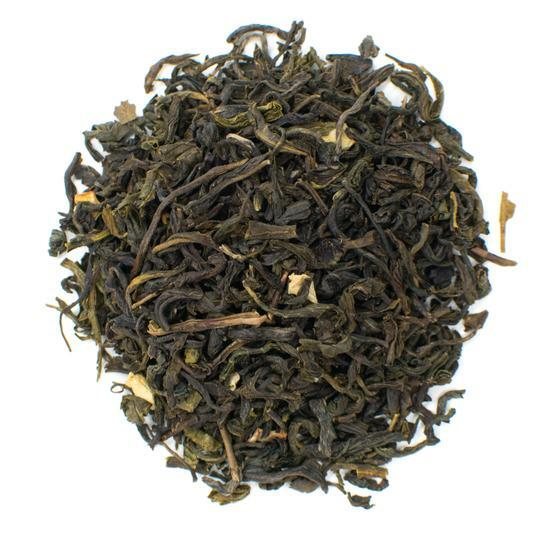 Green tea is a true tea along with black tea, white tea, and oolong tea. Green tea is considered one of the least processed true teas and contains high amounts of antioxidants and chemical compounds found in the tea leaves. This diet involves drinking green tea several times throughout the day. The idea is that ingredients in green tea help to block fat absorption, which may reduce weight gain. Green tea also speeds up metabolism, ramping up the fat burning mechanisms and helping to decrease weight. The green tea diet was first popularized by the weight loss and food experts over at Eat This, Not That! and promoted by Med-Health. The creators recommend doing the diet for 17 days. However, you can keep drinking green tea regularly after the diet without any negative side effects. In fact, most Chinese citizens drink several cups of the tea every day for their entire lives. The green tea diet essentially consists of drinking at least 4 cups of green tea every day. The simple two-step diet requires you to drink a cup of green tea first thing in the morning and then right before each meal. The diet doesn't restrict your food choices so you can technically eat anything from ice cream and red wine to pasta and meat. Keep in mind that the best diet results are achieved by combining a healthy diet with an exercise regimen. Green tea should supplement a solid weight loss program for the best results. 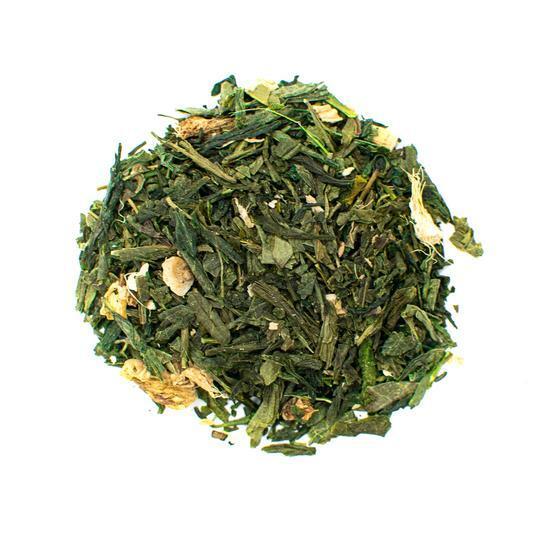 On the green tea diet, you will start the day by drinking an 8-ounce cup of green tea. You can brew it hot or cold, whichever you prefer. Green tea contains mild amounts of caffeine that can help you wake up and greet the day. The antioxidants and vitamins will also help jumpstart your immune system and keep you healthy. The diet doesn't restrict you from having more than four cups of green tea per day. You can choose a cup of the healthy stuff instead of a snack during the day. Experts recommend keeping green tea to 5 or 6 cups per day. 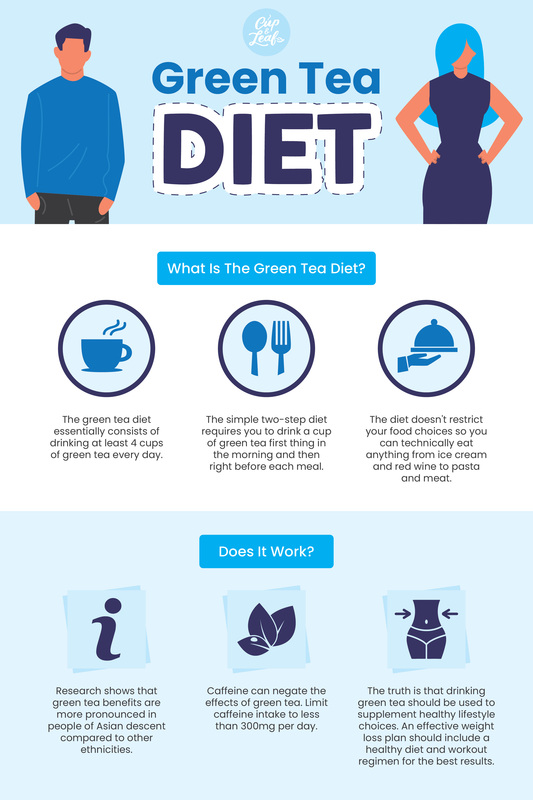 How does the green tea diet work? Experts have attributed the weight loss benefits of green tea and green tea extract to tea catechins, caffeine, and antioxidants. Researchers have found that all of these compounds help to burn belly fat and can detox the body of harmful chemicals that increase risk for weight-related diseases. Green tea signals chemical changes in the body that help improve fat burning processes. The most prominent green tea catechin is known as EGCG or epigallocatechin gallate. A study published in the American Journal of Clinical Nutrition examined the impact of EGCG on weight loss and energy. The participants were given a green tea extract before each meal. Results showed that people who took green tea extract burned an average of 80 calories more per day than control groups (1). EGCG works to streamline fat burning and ramp up metabolism. A study published in Physiology and Behavior found that green tea catechins help to improve fat oxidation—the process that your body uses to break down stored fats. Green tea catechins were also shown to increase energy levels, metabolic rates, and improve liver function. Green tea stimulates metabolism by raising the body's internal temperature. This signals the digestive system to speed up fat burning to provide more energy. Green tea also triggers the release of cellular fatty acids known as catecholamines. These compounds prevent the production of enzymes that slow the production of fatty acids. Green tea consumption aids the breakdown of these fat cells into energy (2). One of the reasons green tea is such a powerful health aid is that it helps to detox the body. Free radicals are atoms or molecules that have unpaired electrons. That makes these agents highly reactive on a chemical level. Free radicals pair up with damaged cells and can wreak havoc on health. Free radicals may cause premature aging, certain types of cancer, weight gain, and heart disease. Free radicals cause damage by increasing oxidation, which is the body's form of rust. Compounds in green tea help to eliminate these free radicals to improve health and accelerate weight loss. Drinking green tea also helps to decrease the risk of oxidation by eliminating toxins. A study published by the European Journal of Nutrition investigated the impact of green tea on oxidative stress. The study analyzed 16 college-level sprinters over a period of 4 weeks. The individuals were divided into two groups and received either a placebo or green tea extract. At the conclusion of the study, the athletes who took green tea supplements had significantly lower levels of oxidative stress (3). Oxidative stress has been associated with weight gain (4). 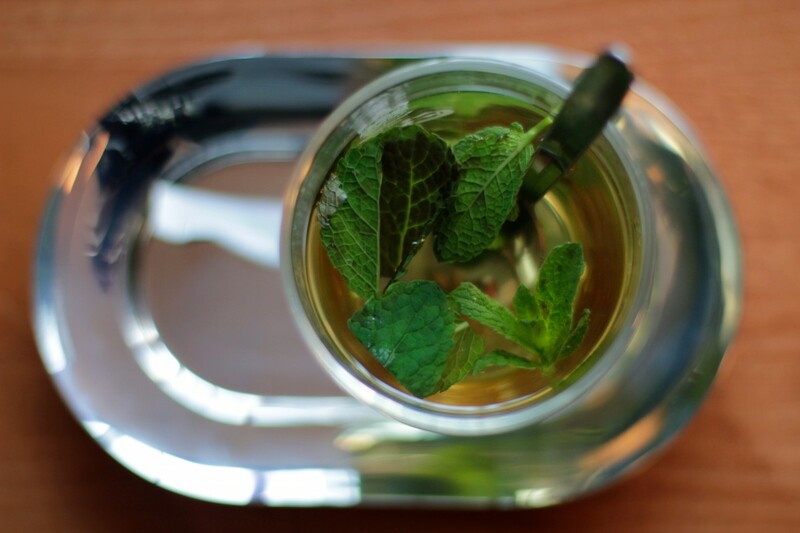 By reducing oxidation, green tea can help minimize weight gain. Caffeine is a naturally occurring stimulant that can increase energy and accelerate weight loss. Caffeine wakes you up in the morning by inhibiting a neurotransmitter called adenosine (5). By blocking this chemical, caffeine also helps to release increased levels of dopamine and norepinephrine—happy chemicals that increase energy and alertness. Caffeine also works directly in muscles to help minimize feelings of fatigue. Caffeine can also help increase energy when you feel lethargic. In terms of weight loss, caffeine can help you power through a workout and may even increase exercises performance. A meta-analysis published in the Scandinavian Journal or Medicine & Science In Sports analyzed the effects of caffeine on exercise in 21 studies. Researchers found that caffeine reduce the feeling of perceived exertion by 29%. That means that you feel less tired or drained when working out (6). Another meta-analysis published in the International Journal of Sport Nutrition and Exercise Metabolism also examined the effects of caffeine on energy in exercise. Researchers combed through 40 double blind studies and found that caffeine improved exercise outcomes by 12.3%. Caffeine was found to be particularly effective for endurance exercises such as running. Drinking green tea can help improve stamina and endurance to get your through your weight loss plan workouts (7). 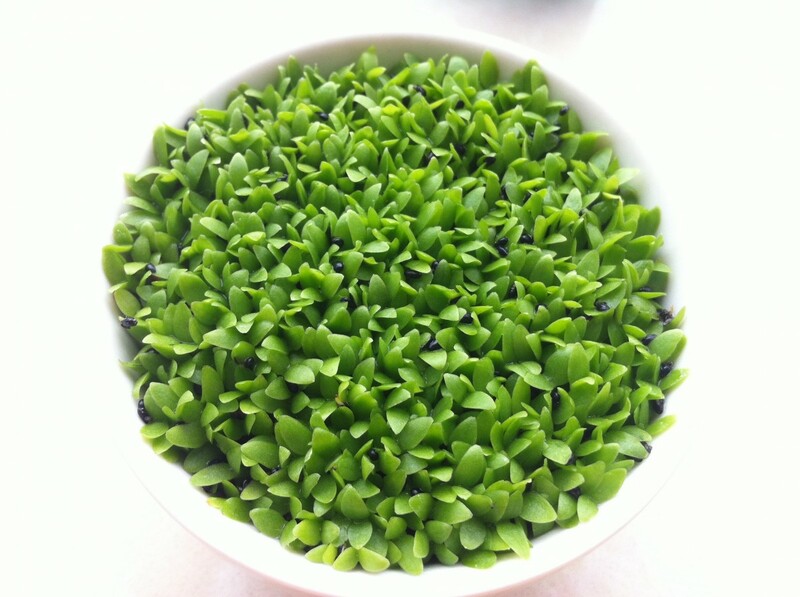 Try our Jasmine Green with Flowers! It’ll satisfy your sweet tooth without the sugary additives. One of the best things about green tea is that it is calorie free. 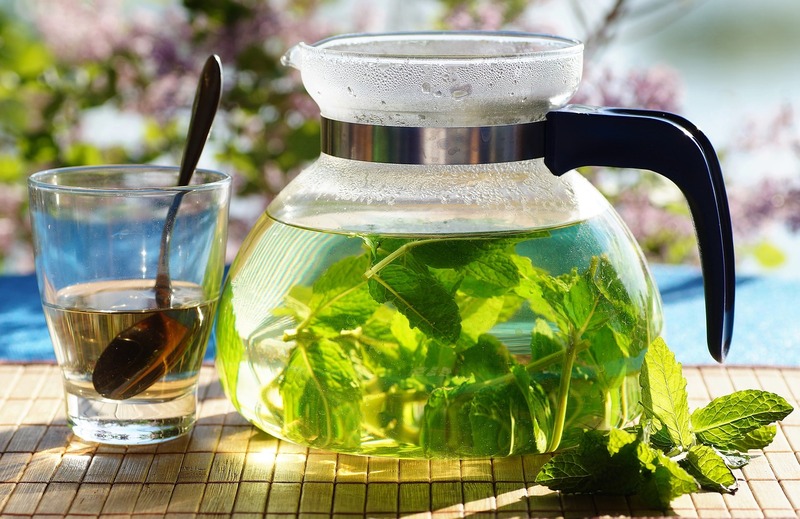 You can easily replace sugary sodas and unhealthy beverages with a delicious cup of green tea. Make sure to limit the addition of sweeteners such as maple syrup to avoid turning this healthy drink into a calorie nightmare. Instead of adding sugar, try brewing your green tea with a dash of flower blossoms or add a natural stevia leaf to your loose leaf blend. There is plenty of research showing that green tea may help to speed up metabolism and increase fat burn. However, these results tend to work best for certain ethnicities. Research shows that people of Asian descent tend to experience better results than those who are Caucasian (8). Green tea weight loss effects are also minimized by high caffeine intake. For this diet to be effective, you'll need to minimize the amount of coffee you consume. Try replacing one or two cups of coffee with green tea throughout the day. This may take some time to adjust to if you consume a large quantity of coffee regularly. Researchers recommend consuming less than 300 milligrams of caffeine to avoid diminishing the effects of green tea. The truth is that drinking green tea alone won't make much of a difference in weight loss. An effective weight loss plan should include a healthy diet and workout regimen for the best results. Drinking green tea is believed to act as a supplement to weight loss plans. You'll need to stay committed on all fronts to see any results. Drinking green tea has very few side effects compared to other weight loss supplements. Most side effects only emerge when consumed in excessive amounts—more than 6 cups per day. Here are some things to keep in mind when drinking green tea. Green tea is diuretic in nature and can lead to dehydration if consumed in large amounts. Make sure to drink equal amounts of water throughout the day to avoid this side effect. Green tea does contain small amounts of caffeine, which can cause sensitivity in certain individuals. Drinking green tea after dinner or before bedtime can lead to restless sleep or insomnia for some people. Try to drink your last cup of green tea just before dinner. Aim to have dinner ready to go at least 2 or 3 hours before your usual bedtime to ensure a good night's sleep. Drinking large amounts of green tea may cause stomach irritation in certain individuals. This side effect tends to increase when people also consume caffeine. Try to consume a smaller amount of coffee than normal if you are on the green tea diet. You can also drink green tea after or during a meal rather than before if that helps to minimize discomfort. Drinking tea can help you lose weight fast when combined with traditional weight loss techniques. Increase your energy and slim down faster by adding green tea to a healthy diet and workout plan. 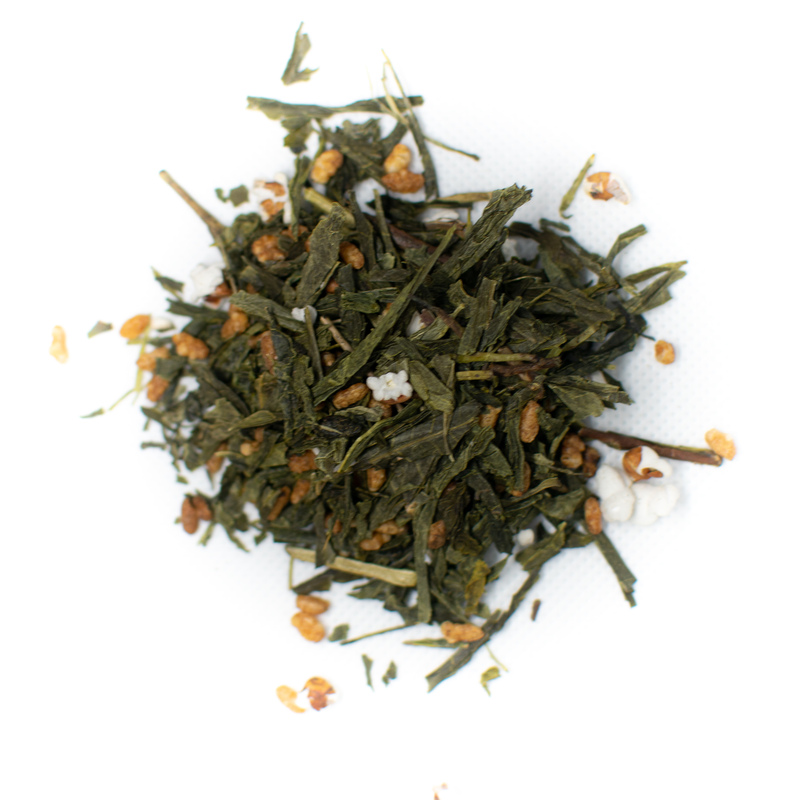 Learn how to brew the perfect cup of green tea right here. All you need is boiling water, some loose leaf tea, and a tea cup. You can also check out our fun green tea recipes to add a new spin to each mealtime beverage. You'll be looking your best in no time if you drink tea, eat healthy, and workout regularly.